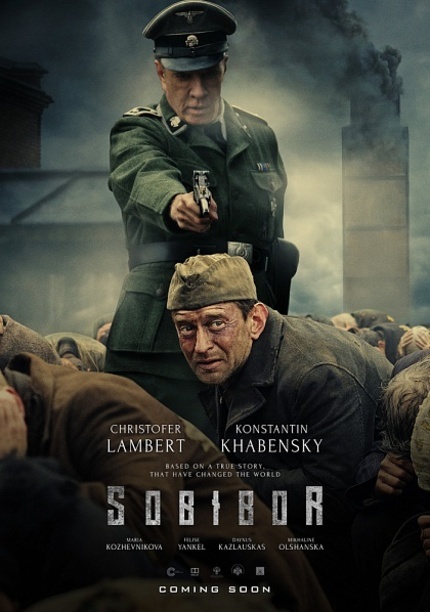 Russian star Konstantin Khabenskiy rose to international fame through his lead roles in Timur Bekmambetov's Night Watch films - followed by a memorable support part in Bekmambetov's English debut Wanted - and he now makes his directorial debut with the upcoming Sobibor. And, yeah, it would appear he's learned a thing or two over his long career as one of Russia's most notable leading men. Sobibor itself was one of the most notorious Nazi death camps in Poland, believed to be the site of the mass executions of at least a quarter million Jews. But at the end of its life Sobibor was also the site of a successful escape with 600 prisoners engaging in revolt, roughly half of those making it out of the camp, about fifty of whom ultimately evaded re-capture. And that is the story being told here. Production values are excellent with Khabenskiy looking to neatly balance scale and intimacy. And, yep, if Nazi officer Karl Frenzel looks familiar you are correct: That's the Highlander himself, Christopher Lambert in the bad guy role. Take a look at the trailer below.